Here is something that one does not see too often in the futures markets - trend following hedge funds on the wrong side of a market. I am referring to the corn market which has been hit hard by selling ever since the acreage numbers first came out and the weather became nearly perfect. Throw on top of that USDA supply and demand numbers and the downtrend has been relentless. Take a look at the following chart and you will see what I mean. The price of corn has gone from near $5.20/bushel to its current $3.78, a drop of 27% in two months time. 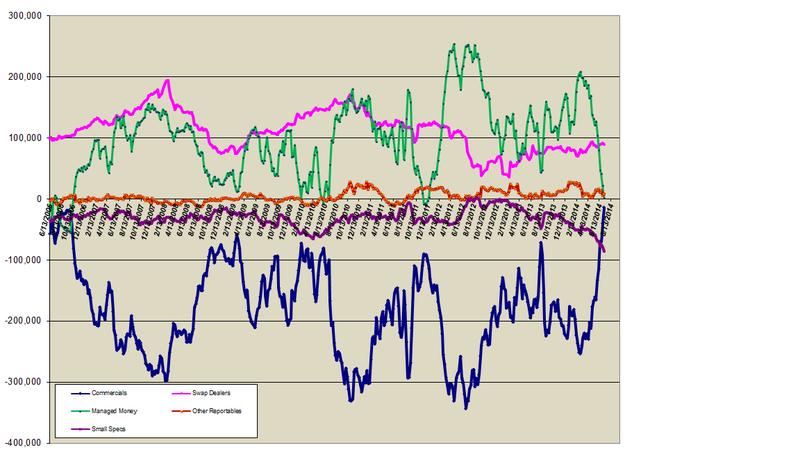 Now take a look at the chart noting the positioning of the various players in the corn market. While it is not unusual to see long liquidation from the hedge funds accompanying a move lower on the price chart, what is unusual is the fact that even though corn has taken out both its November 2013 and its January 2014 low - the point at which these hedge funds began building their massive net long position which took the market up - these same hedge funds remain net longs. As a matter of fact, they even added slightly to that position in this latest COT report. They are massively underwater on these long positions; something rather uncommon to see in this day and age of computer-driven markets. Even more interesting is the fact that the little specs, the small traders, the general public, usually the guys on the wrong side of the market, are all on the correct side and are making money at the expense of the gigantic hedgies. Chalk up one for the little folks! One shudders to think what might happen to corn price should the hedge funds actually totally abandon the long side of this market and start moving over to play it from the short side. 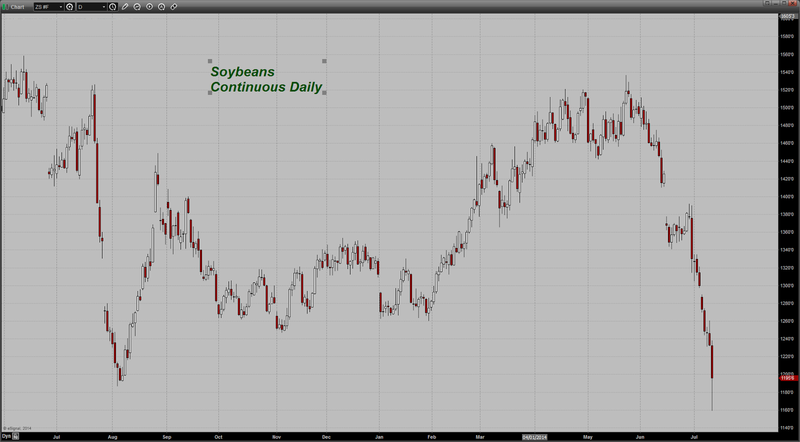 Here is a quick shift over to the soybean market. Look at the price action over the last six weeks. They have imploded lower dropping from up near $15.40 all the way to today's 11.95 close. 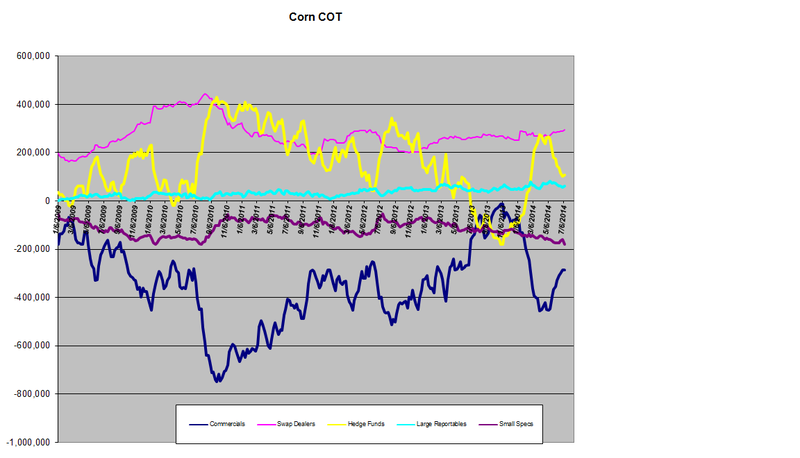 The COT report for beans clearly shows why in terms of money flows. Since March of this year, hedge funds ( managed money ) have been liquidating longs as the price has continued to move lower. What is also remarkable is that even though prices have broken below the January lows - the point at which the already net long hedge funds really began to ramp up longs - this category of traders remain net long as of Tuesday this week. In other words, they have also been losing money in the beans as well as in the corn. Based on the carnage that today's USDA report unleashed in the grain complex, my educated guess is that they have finally moved over to the net short side of the beans although I would not think the position is up over 25K net short at this point. Maybe by next week it will be. The point in all this is that if the hedge funds decide to press the short side of the bean market - and in the face of what is now expected to be a massive crop this year - beans could see even more selling. USDA today shocked the market, as it did not that long ago, with an even larger than expected acreage number of 84.8 million acres. They left yields the same but that larger acreage number means a lot more beans are expected than what the market was trading prior to the report. Right now we are looking at a 3.8 billion bushel number. That was up from the June estimate of 3.64 billion. What saved this market from even more selling was the fact that today is a Friday and the USDA report hit the wires after a week during which beans had already been moving lower. Some shorts decided to go ahead and book some profits before heading into next week. That short covering took the price well off the worst levels of the session. There was also a bit of sentiment that unlike corn, it is a bit too early in the growing season to completely remove all the weather premium. Bean traders will be looking at the longer term forecasts, particularly for the month of August to try to get a handle on the weather during that all-important time for this market. If the forecasts continue to be benign, hedge funds will be at work selling. We will see what we get next week. 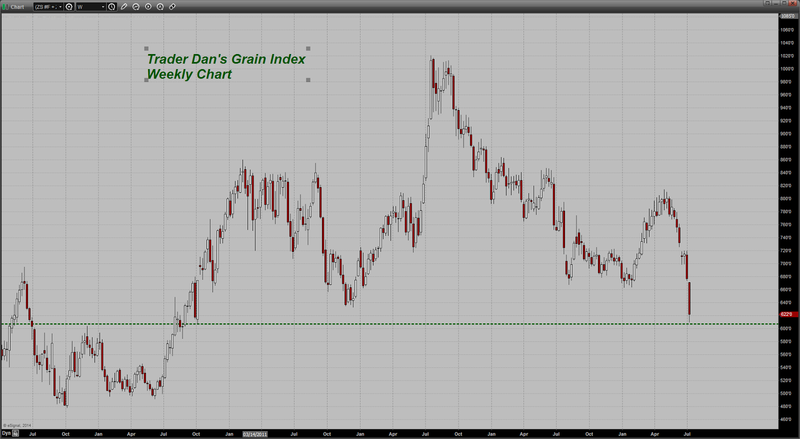 I will leave you with an updated chart of my Trader Dan's Grain Index. It hit a 45 month low this week. With the relentless and continuous crashes throughout the commodity complex the last 3 years after prices get to the upper end of the range, I'm sure the Fed is now ultra confident that inflation has been whipped for good. And at the first whiff "trouble" in financial markets, they will unleash yet another torrent of "Infinite Fiat" to support stocks and debt instruments, which will cause yet another brief spike in commodity prices, only to be followed by the inevitable "Frightening Collapse" in prices later. And last night I thought crude oil had maybe stabilized. Mark if the US economy is booming as per the Feds miracle pill then interest rates will rise along with inflation. Mark, maybe you are right, but I would not want to press the bull case in bonds that bottomed in 1981. I don't like betting a buck to make a nickel, which is about what kind of payoff bond buyers are going to get EVEN if they are right. 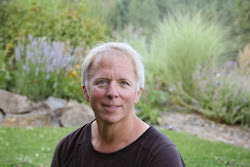 To me, Gross is burnt out and so is his recent re-hire McCulley, as far as their interviews have looked. El-Erian was the smart one to bail out. Maybe like the arch-duke Austrian assassination, this week's Portuguese bond fiasco is the match that lights off the worldwide bond implosion. Sooner or later, the truth comes out. The El Niño that many though would end the three year California drought has been downgraded for the second time to a "weak" level. This suggests a more normal winter and maybe a break even water year. If so farmers will get no water from the state water project. Fines will be levied for water waste. More price and supply dislocations. As there is zero wild feed growing wild animal populations will be decimated. Look for an explosion of vermin if it ever does rain normally. Dan: U may have just broken a record...first missive I can remember where the word " Gold" never appeared ! Have a good weekend as well my friend. I always own some gold ( and silver ) stocks, but I would never like any of them to go up because of these wars ( blood profit money). Inflation or currency debasement: yes; wars no ! Dan, I have a small question, as I'm really not an expert about COT and the actors there. You wrote that Hedge Funds are the ones who move the market. Commercials are technically supposed to be bona fide hedgers meaning that any futures positions that they take, are offset on the physical side by either inventory or production, etc. There are some Commercials however, who will at times, speculate in the market. They are not supposed to be doing this but we all know how human nature is. I monitor the positioning of all the players but it is my view that it is the large hedge funds which drive price action. Generally speaking, when they are buying, commercial entities are usually on the sell side. the reverse is true when hedge funds are selling, commercials will be buying. Some people refer to Commercials as "Smart Money" implying that the hedge funds and other large specs are the "Dumb Money". I would say that those who still advocate this are the "Dumb Analysts". Once upon a time, in a galaxy far, far away, the Commercials were the 800 lb gorillas in the pits. They were the largest players. That is not true anymore especially in this new era of unending amounts of Central Bank liquidity. Much of that money ends up in the markets in search of yield and we know, the Central Banks have been creating tons of that. In regards to the futures markets, that liquidity can be used to also drive down prices through paper selling if the hedgies believe that they can obtain better yields in stocks or in bonds. What one will generally see in those instances, is commercials on the long side buying as the market descends because they are obtaining hedge coverage for feed needs for example in the grains. As far as Hedgies being "herded" by Commercials, one has to shake their head at such misinformation. Well, I don't know, but the OBVD closed once more on a positive note on my chart on friday, and it actually went through this level of resistance...so I don't know but I'm betting on the hope that it will mean some bears forced to close their short positions, more short covering, and a short-term target of 22 $, where I will sell 50% of my recent long position, and raise my stop loss at 21.30 if we make it there. Copper seems like it may also try it above 330, but I'm also looking for short term correction from those levels or a little above, top of the range like 335. Gold...closed really too close from 1337 so that I feel safe... I'd like to see a daily close above 1337 to get back in the train...especially I'm already long silver. It's one thing to say the bottom is in for metals, and quite another to say that there's very much to get excited about for the future. I'm ambivalent about the former, and "meh" about the latter. I'm coming around to the opinion that no matter what the market environment, there is likely to be some asset class out there that is as good or better than metals. Insurance policy? Not so much. To me igold is mostly as Dan mentioned : mostly an insurance. Regarding asset classes as good or better than metals here and there, of course. Just watch Dan's previous charts on cord and beans, and being on the short side was much better than waiting for gold to rise with the same amount of paper contracts. I mean, when you try to think about in purely theoretical, fundamental terms, what would make one think that an ounce of gold or silver would really be a better store of value than...say...a bushel of wheat? Look up an inflation adjusted long term wheat chart. It's not a happy picture. At least, not for MY money. Eric, the point being that you are trying to be analytical and logical, like me and a host of others. The tidal wave of hedge money or whatever will engulf whatever sector and just take your head off. They own the media, so the drumbeat will roll about Syria, Libya, Ukraine, CAR, Gaza and whatever,so you better own the metals? We all saw what has been manufactured in stks over the last 6 years, so maybe the donkeys at kwn will be right now and silver goes to the moon with Jackie gleason and alice. Eric, it is all smoke and mirrors. The real welfare being handed out is to the military/industrial and ag and insurance and big pharma. Just makes me laugh when they portray the 50m food stamp recipients as being the problem. Anybody here understand the difference between causes and effects? I have a strong feeling gold is going to hit 1400 really really soon. I'm loading up! Hubert, who is dfly? Your 1337 number seems to mean something. dfly; guess what? I have a strong feeling that you are just another Indian donkey parasite, so load up sonny and have a nice leech life. so dfly, who are your mentors, really? Gold dropping in the overnight Asian session. 1333 at 12:30 PM eastern time. It will be interesting to see what the morning brings. Does dfly have a comment? As a result, I'm already out of 50% of my long silver position at 21.25 (after a long at 21.33). I keep the remaining 50% just in case, it's very small, but without any conviction at the moment. Stopped out of my SP500 at 1970... Mark is winning again (but I don't lose my money :)) and resistance in the 1973-1975 area...it was above my entry level, so, no regret, I don't want to lose a penny being short on SP500 at the moment. Hubert, you are staying pretty much right it would seem. Stks shake but don't break and pm's pop but then fizzle. My call that the bottom is in seems premature at best. We shall see. CME Group is lowering margins, and precious drop. What has changed / happened over the weekend? The big move was in the overnight. Hedges getting out? Sure plenty of trouble with Hamas. Alex, I remember silver quoting near 50 $ and being hammered by 3 consecutive moves to lower margins. It seemed to me at that time that bulls were getting pummeled. Why do you say "usually they drop when margins are increased"? The paper game can be played both long and short, so it would seem to me that lowering margins will impact the side which is over leveraged, no matter if it 's bulls or bears. Wrong? Right, the paper game does not prefer a specific side. Usually you see increasing margins, when a game has become too excessive. They (the place) stop it by referring to increased volatility. They improved conditions for speculating, and the mkt reacted by being worried, and went out of positions (i.e. long positions). That event looked to me, as if they had known, that the game was about to collapse, and they had tried to avoid the worst by lowering margins quickly, - but it was too late. So my interperation means, at this event (Ag 50$) it was the opposite of causing and result. First the mkt moved, and then the margin measures were done. But what was the reason / intention this time? Fellows, let us be honest here; volume is collapsing at Duffy's Dirty CME, so regardless of anything they drop the price to play; when it becomes obvious to everyone that real estate is nothing more than an echo created by PE thieves, you will finally see commissions drop there also; come on 6% to show and list something? Wow, $35 drop in gold, looks like the KWN world is about to morph into a "Nightmare" after predicting an epic short squeeze in silver, LOL!!!! Man, these guys will never learn! july ags go off the board today, so the traditional continuous chart will change.. last trading days can be turns in markets. 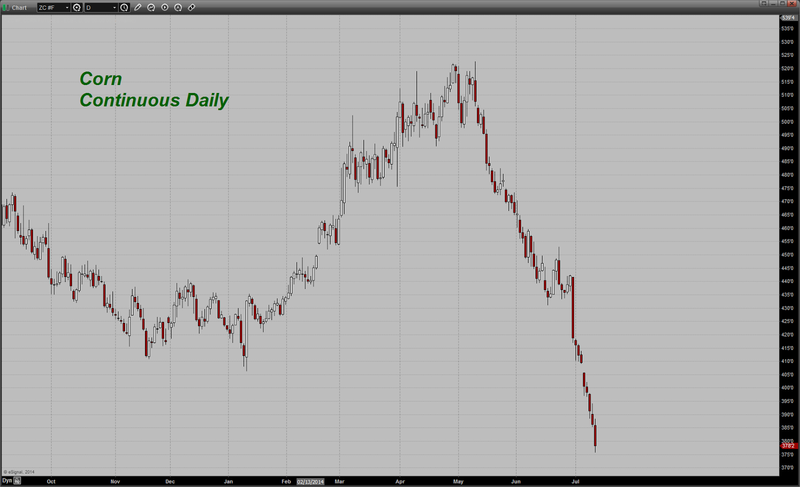 probably some margin call action off the new lows last friday in ags as well. chicago wheat needs to lead, i'd like to see regaining 551 on the continuous chart to 'spring' a move higher in the ags. silver counts as a 'full moon turn' since full moon came in saturday. stock markets made the low the week before op-ex week, so that's traditionally been good for bulls. Alex, they will change the rules when the PTB are wrong, just like in '80 when the Hunts had the locals beaten severely to the point where they went to liquidation only or 100% margin. Point being that Bunker should have taken profits and not tried his corner, because history teaches us that that always fails. Tulip Bulbs, South Sea, Railroads, RCA, and on and on. The message is do not be a pig because all mkts turn.